Mortgage rates spiked again this week and reached their highest levels in two on more market speculation that the Federal Reserve will reduce future bond purchases following June's strong employment report. The economy gained 195,000 jobs in June, above the market consensus forecast, while revisions to the prior two months added 70,000 on top of that. Moreover, hourly wages rose by 2.2 percent over the last 12 months and represented the largest annual increase in nearly two years. 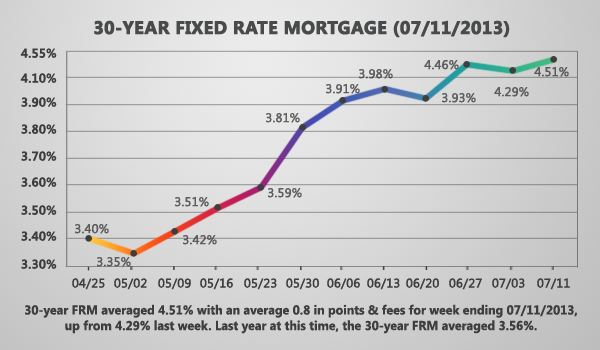 30-Year Fixed Rate Mortgage - The 30-year FRM averaged 4.51% with an average 0.8 in points & fees for week ending 07/11/2013, up from 4.29% last week. Last year at this time, the 30-year FRM averaged 3.56%. 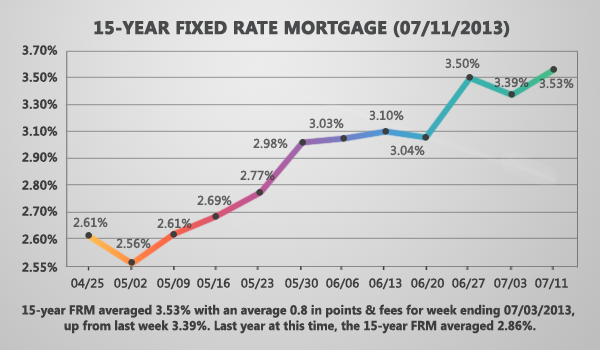 15-Year Fixed Rate Mortgage - The 15-year FRM averaged 3.53% with an average 0.8 in points & fees for week ending 07/11/2013, up from 3.394 % last week. Last year at this time, the 15-year FRM averaged 2.86 %. 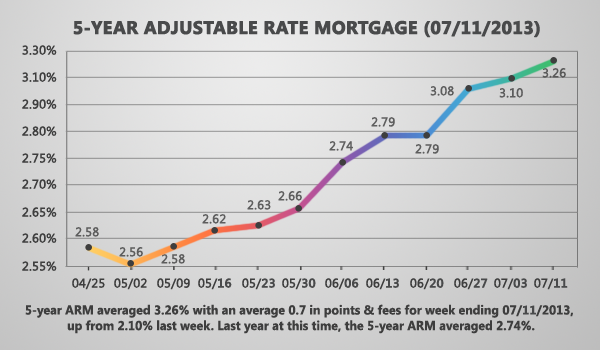 5-Year Adjustable Rate Mortgage - The 5-year ARM averaged 3.26% with an average 0.7 in points & fees for week ending 07/11/2013, up from 3.10% last week. Last year at this time, the 5-year ARM averaged 2.74%. 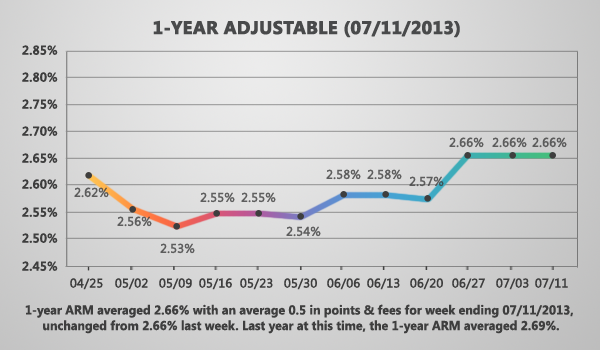 1-Year Adjustable Rate Mortgage - The 1-year ARM averaged 2.66% with an average 0.5 in points & fees for week ending 07/11/2013, unchanged from last week. Last year at this time, the 1-year ARM averaged 2.69%. It seems unlikely rates will fall much unless the U.S. economy slows down significantly or the Fed announces that it will continue to spend $85 billion per month in bond purchases. Fed Chairman Ben Bernanke has said the Fed might reduce the size of the bond purchases this year. But minutes of the latest Federal Reserve policy meeting, show members of the Federal Open Market Committee have mixed opinions about when to end the program. Higher rates also are creating a sense of urgency among homebuyers, as they watch home prices climb and encounter bidding wars. There is a lot more interest from buyers, but there's no inventory so often times there are multiple offers on the table and seller concessions are starting to go down.